The increasing computing power of mobile devices has led to an ever-expanding list of games featuring companion apps. Mobile is here, and it's here to stay. The Skeltr lets you take full advantage by placing your smartphone or tablet front and center of your gaming experience. ROCCAT's very own Power-Grid app is the start. It works as an advanced and fully-customizable remote control for your PC, letting you connect to, monitor and control your software. Perfect for the Skeltr. Swarm provides next-level computer to mobile device integration for Skeltr. PC side it works as a veritable gaming command HQ, offering a software and driver suite plus an overview of all your ROCCAT device settings. Smartphone side it's an extension of the computer software, letting you quicklaunch games, configure illumination options, check you're APM, your GPU/CPU temperatures - and more. Also features Talk FX + AlienFX support, providing lighting effects for your favourite games in 16.8m colours. 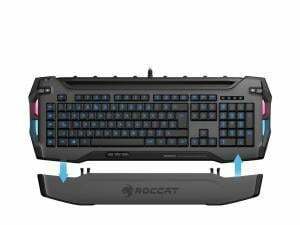 - Roccat Swarm + App, Control Skeltr; Monitor APM, CPU, GPU, Ram Etc.